Another milestone tonight. After this evenings beer, the 365 will be one third complete. That also means I am just 60 beers shy of the halfway point. Not too shabby. One thing I would like to try to accomplish from here on out is to have a beer from every state in the US. I have already covered 22 states, 28 in the next 243 beers seems possible. I wonder if every state has something brewed in it…time for some research. 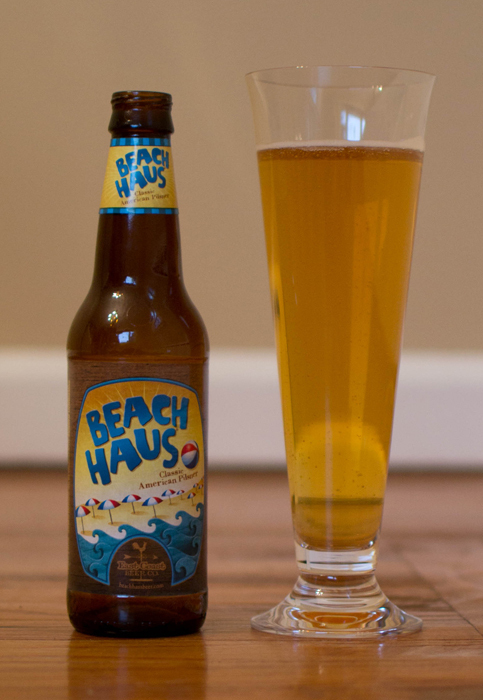 On to beer #122 which is Beach Haus by East Coast Beer Company. Brewed right here in the great old Garden State, New Jersey, this American Pale Lager (I think of these as Pilsners) has an ABV of…I have no idea. It is not printed on the label and it is not on their website. Odd. Into my pilsner glass this went and it had a golden yellow color with no head. There were quite a lot of bubbles rising to the top, it looked really cool. The nose was light with some grains, cereal, and a bit of grass. It tasted very grain like with maybe a touch of lemon peel near the finish. It was a very crisp and fairly bitter beer. It had a very light body and a ton of carbonation. It would be pretty easy to drink a few of these if it was ones desire, it wasn’t mine though. There was nothing wrong with this beer other than it being just a ho-hum brew. Here hoping the next 243 are a bit better than this.